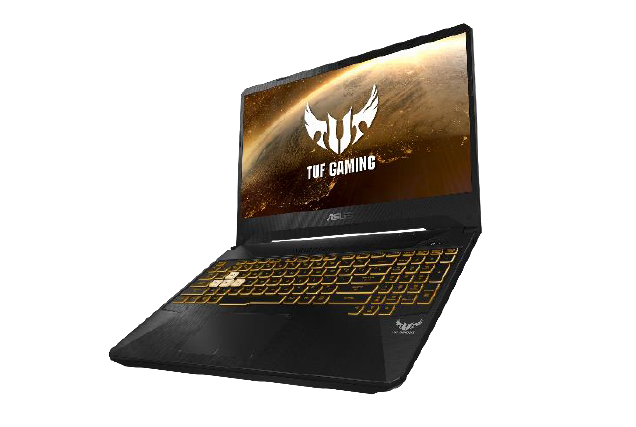 Asus has announced the TUF Gaming FX505DY and FX705DY laptops featuring AMD’s Ryzen 5 3550H APU and Radeon RX 560X GPU. If that isn’t enough to tempt prospective buyers, the Taiwanese manufacturer has also incorporated IPS-level FHD NanoEdge displays into the two laptops that utilize AMD’s FreeSync dynamic refresh rate technology for enhancing gaming sessions. Asus has taken the opportunity to reveal two new gaming laptops to its range at CES 2019. The latest additions are the AMD-based TUF Gaming FX505DY and FX705DY devices. Both notebooks feature AMD’s brand-new Ryzen 5 3550H mobile processor that offers four cores and eight threads of computing power. For graphics, Asus has selected the mid-range AMD Radeon RX 560X discrete GPU. The 15-inch FX505DY laptop features a higher refresh range than the 17-inch FX705DY. While both TUF devices have panels that can operate with FreeSync from 40 to 60 Hz, the 15-inch variant can offer a higher rate of 48 Hz to 120 Hz, which Asus recommends for fans of games like Counter-Strike: Global Offensive and Overwatch. Up to 32 GB of DDR4 2400 MHz RAM will be made available, and storage options include up to a 512 GB PCIe SSD and up to a 1 TB FireCuda SSHD. Gamers have been catered for with the input devices too. The keyboard is backlit, has a full-sized numpad, and it offers highlighted WASD keys. Red Matter versions of the FX505DY and FX705DY come with red backlighting, whilst the Gold Steel variants bring customizable RGB lighting. Naturally, the new TUF laptops live up to their moniker: The devices meet MIL-STD-810G standards thanks to their reinforced cases. 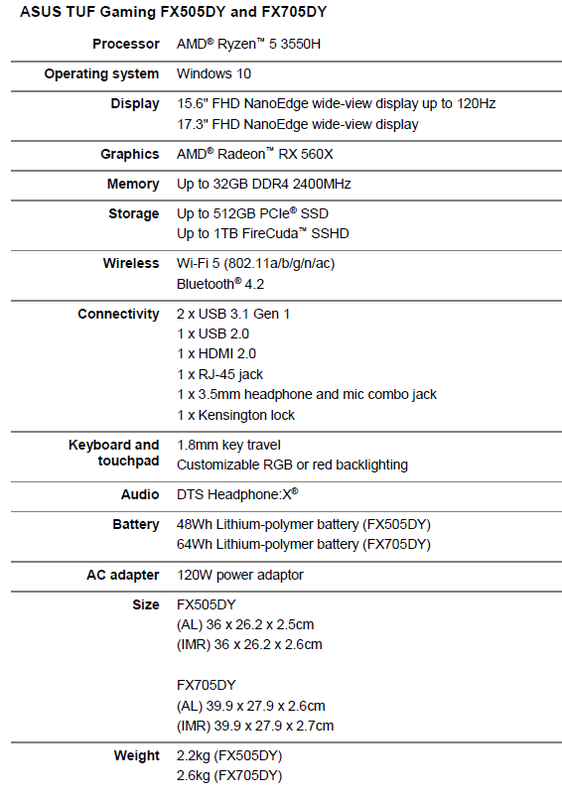 Connectivity includes 2x USB 3.1 Gen1, 1x USB 2.0, 1x HDMI, 1x RJ-45 jack, and 1x 3.5 mm combo audio. Audio tuning is provided by DTS Headphone:X that allows for 7.1-channel virtual surround sound, and the devices weigh in at 2.2 kg/4.85 lbs (FX505DY) and 2.6 kg/5.73 lbs (FX705DY), respectively. The Asus TUF Gaming FX505DY and FX705DY laptops are expected to be made available in the first quarter of 2019; however, no prices have been given for these AMD-based models yet.